Nebraska Governor Pete Ricketts reads the proclamation proclaiming April 12-18 as Rodeo Week in Nebraska in front of the Governorâs Mansion, while University of Nebraska-Lincoln rodeo team members look on. Courtesy photo. Nebraska Governor Pete Ricketts is quite comfortable on a horse. And he got the chance to ride one on Monday, April 13, when he signed a proclamation declaring the week as Rodeo Week in Nebraska. 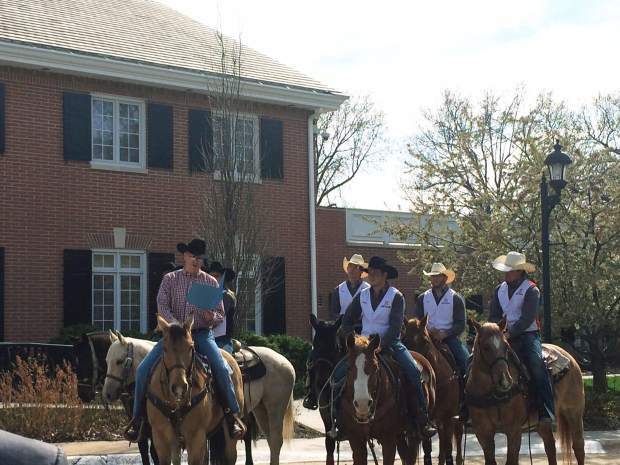 He, along with the University of Nebraska-Lincoln college rodeo students, rode around the Governor’s Mansion in Lincoln and finished the ride with Governor Ricketts signing the proclamation, declaring Rodeo Week in Nebraska to be April 12-18. The week culminates with the 57th annual UNL Rodeo, held April 17 -18, at the Lancaster Events Center in Lincoln as the culmination of the week. UNL student Hannah Ulrich, rodeo coach Bump Kraeger, and alumni Bob Bennie did the behind-the-scenes work to get the proclamation made. Bob Bennie, who was on the UNL rodeo team in the late 1970’s and early ‘80s, said Ricketts was comfortable on horseback, and the rodeo team made sure he had the correct clothing as well. A cowboy hat, donated by the Ranch-Land Western Store in Ainsworth, and Vitalix, was given to him. This isn’t the first time that Rodeo Week has been proclaimed in the state. When Bennie was a UNL student in the late 1970’s and early ‘80s, it was an annual occurence. And he hopes it will continue to happen each year.